Greetings to all of you from Boston. I'm sorry to report that the 'thaw' has once again become a freeze. The Obama administration has issued an executive order calling for the labeling of products made in the West Bank Judea and Samaria as not having been made in Israel. The order comes amid an effort by the European Union to label Israeli-made goods, a move the Israeli government called anti-Israel and that prominent anti-Semitism watchdog groups have condemned as among the worst incidents of anti-Semitism in 2015. This is a shift from the administration’s previous position. A State Department spokesman told reporters in November that such labeling could be perceived as “a step on the way to a boycott” and said boycotts would be opposed by the administration. The new guidance references a decades-old administrative directive that sought to promote the import of Palestinian goods produced in the West Bank. The Obama administration is facing criticism for reinterpreting it and enforcing it to punish Israeli businesses. Good produced in these areas are not to be labeled “with the words ‘Israel,’” according to the memo, which warns that inappropriate labeling will subject the products to “enforcement action” by Customs and Border Protection. “Goods produced in the West Bank or Gaza Strip shall be marked as originating from ‘West Bank,’ ‘Gaza,’ ‘Gaza Strip,’ ‘West Bank/Gaza,’ ‘West Bank/Gaza Strip,’ ‘West Bank and Gaza,’ or ‘West Bank and Gaza Strip,’” according to the directive. “It is not acceptable to mark the aforementioned goods with the words ‘Israel,’’ ‘Made in Israel,’ ‘Occupied Territories-Israel,’ or any variation thereof,” it states. The Obama administration has reacted by claiming that nothing has changed. A State Department official who spoke to the Washington Free Beacon on Thursday said that the department is aware of the new memo but does not view it as a shift in longstanding policy. “Longstanding U.S. guidelines, dating to 1995, on country of origin product marking requires that products produced in the West Bank be marked as products of the West Bank, and products of Israel be marked as products of Israel,” the official explained. Except that for 20 years, no one bothered to label products that way and no one noticed. What does Gaza produce besides terrorists? Please note that the consulate - the de facto embassy is in "east Jerusalem" therefore according to Obama it's not in Israel at all. It must be closed and moved or just closed. What's on the Khalidi Tape? 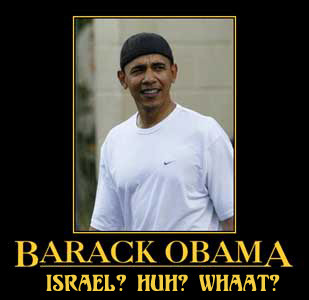 How much of a h*rd-*n did Barack later get when Sharon pulled everyone out of the Gaza towns? When he speaks of Israel's "settlement" program in the West Bank, precisely HOW would he like to define "settlement"? We need Glick to run for office in Israel. terms for politicians, not the Euro trash style. There is in fact no accountability and all offices are up for purchase.